Jogging keeps you fit and is healthy. However, athletes that start training can overdo it and easily pull and tear ligaments. A new high-tech running shoe will evaluate running form in real time and thereby counter these injuries in future. Hardly any sport is as popular as jogging. About ten million people in Germany are training regularly. No wonder, be- cause running is the ideal way to reduce stress, lose excess fat, and improve endurance. Running stabilizes the immune system, prevents cardiovascular disease, and builds muscle. However, despite its numerous positive effects, jogging is a desirable sport with undesirable side effects – and the number of running injuries and joint com- plaints is increasing. Runners run risks of twisting or injuring an ankle joint, especially on uneven ground or when fatigued. Pulled ligaments or even a broken ankle can result. If muscles are not warmed up or a person overestimates their condition, training is often interrupted due to knee pain and pulled or torn muscles. 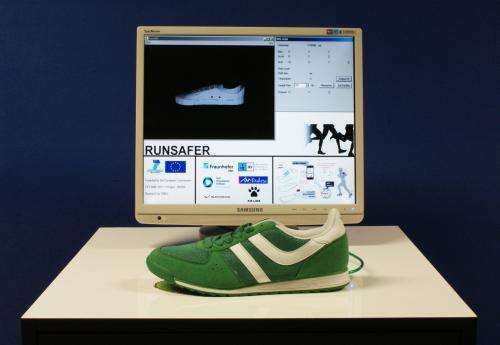 To prevent these kinds of injuries and symptoms of muscle overload during training, researchers from the Fraunhofer Institute for Photonic Microsystems IPMS in collaboration with five partners are developing a specialized running shoe in the EU Project RUNSAFER (www.runsafer.eu). Sensors and microelectronics integrated into the sole of the shoe will measure the biomechanical data of the athlete and evaluate the runner's form with the help of measurements in real time. "Pulse-rate watches and chest straps record only vital signs like breathing and heart rate. In contrast, our running shoe medically evaluates and moni- tors training while jogging. It informs the runner for example of incorrect foot position, asymmetric loading, or warns of exhaustion or overload. There has never been a comparable device before," says Dr. Andreas Heinig, a scientist at IPMS. The measurement system can be easily installed and removed from the soles of the shoes. To charge it, the pair of shoes is placed on a charger that is included. Besides the microcontroller, the RF module, and batteries, the system comprises accelerometers and GPS sensors that capture the biomechanical signals from the body as well as the runner's speed and transmit it via Bluetooth to the runner's Smartphone. A Smartphone app evaluates the data in a split second with the help of specialized algorithms and gives the athlete feedback on training performance. If necessary, the app makes suggestions about running form or the training routine. "The app could recommend running more slowly, for example, or rolling off the foot differently, suggest seeking a different running surface or stopping if necessary," as Heinig describes the different guidance. In addition, the measured values are transferred during the run from the Smartphone to a website for further processing, evaluation, and display. A customized training program can be set up based on this data with personalized performance goals that are constantly updated. A prototype of the running shoe is already done, as is the cell phone app. The researchers are presently working on a still smaller version of the microelectronics and sensors – a big challenge, particularly since the system must be waterproof, light, and durable. The high- tech shoe should be available for sale by the beginning of 2015. RUNSAFER-Project partner New Millenium Sports SL, the Spanish manufacturer of athletic shoes and sports- wear and owner of the Kelme brand, will be bringing it onto the market.